Large 2 BR 3 BA. ski-in, ski-out. Piscine intérieure / extérieure, bains à remous. Living Resort! Spacieux 2 BR 3 BA et un lit Murphy avec aire de repos privée dans le salon. Plus de 1500 sq. Ft. Grande cuisine et salle à manger. Les deux chambres sont équipées de lits king-size avec leurs propres salles de bains avec télévision par câble. Master bain a une baignoire jacuzzi. Grande skis aux pieds la distance emplacement de marche (ou de ski) dans le village, mais plus calme que la superficie de base. Unité au premier étage - pas d'escalier! Idéal pour les familles avec enfants. A la piscine intérieure / extérieure (la seule piscine dans un skis aux pieds situation à WP), bains à remous, bains de vapeur, les locations de ski et sur le site de ski et snowboard boutique. Grande salle de gym sur place, aussi. Si vous ne vous sentez pas envie de cuisiner dans notre grande cuisine, la station dispose d'un nouveau restaurant, Le Bistro, avec une heure par jour heureux, des spectacles le week-end et 3 nouveaux téléviseurs à grand écran. 3 salles de bains, deux suites et une salle de bain complète que les services salon et la cuisine. Bath en maître lit a baignoire à jet. Voir: http: // www. ironhorse-station. com /. Deux chambres à coucher complètes trois salles de bains complètes avec plus de 1500 sq. Ft. La chambre principale a une baignoire jacuzzi. Le salon est mis en place avec un lit escamotable et le mur diviseur pour créer une autre aire de repos privée avec baignoire. Unité au premier étage - pas d'escalier! Remise pour skis. Overall, family had a great time and we would definitely go here again. Ann was very responsive and helpful. Plenty of room and great selection of cooking utensils; also, full size washer and dryer. Very comfortable. Living room was comfortable and had everything we needed (tv, cable, dvd, etc. kids enjoyed the pool and hot tub facilities on site. The bedrooms were good; mattresses were a little uncomfortable. Getting the water temperature just right in the showers took a little time. Overall, we really enjoyed though and would recommend to others. First time at winter park and we’ll be back. Perfect ski trip for our family! Great location with easy shuttle access to base or ski down after an elevator ride. Our kids loved to pool and hot tubs and loved playing with all the games that are at the condo. 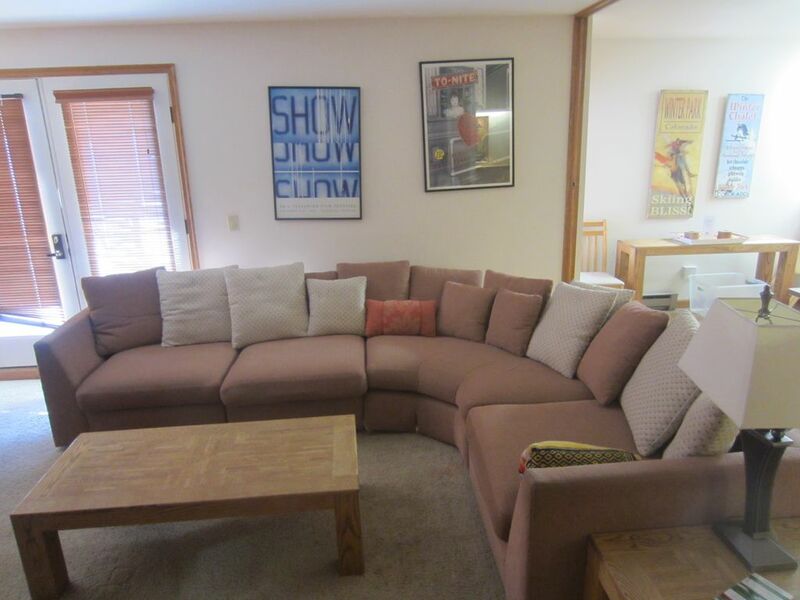 The condo is well stocked with everything you would ever need and very comfortable for our family of 6. Ann was fantastic to work with. We'll stay again. Easy to work with and a great place to stay. The condo was a great place to stay! Had two couples and there was more room than we could have ever needed. Ann (the owner) was great to work with and easy to get a hold of if questions arose. We will be back again! Great Place to Stay @ Winter Park! Had a great president's day family ski vacation at this condo at Winter Park. The kitchen, living room, bedrooms and balcony were very comfortable and spacious. We loved the giant bean bag, fireplace and having 3 full bathrooms was very convenient. It is located right on the "Corridor" ski trail between Mary Jane and Winter Park lifts and has a ski shop to rent equipment right there in the complex. We skied 3 days and it was nice that everyone could ski at their own pace and just meet back at the condo, being on the ground floor was much appreciated when in ski boots. Everyone enjoyed the sauna and indoor/outdoor pool and since there were two outdoor hot tubs, we were able to have one to ourselves to soak in during a snow storm, very cool. The place is a short walk to the resort village (just close enough) and there was also a shuttle that ran quite often. The town of Winter Park was only a few miles down the road. It is a very nice town, we did some shopping and had dinner throughout our stay at , The Ditch, Hernando's Pizza, and Deno's Mountain Bistro which were all great. We also rented snow mobiles from Grand Adventures and rode up to 12k feet with a spectacular view of the entire area, it was breathtaking. Although we didn't need to contact them, the owners were available via phone, text or email. I highly recommend this place if you are looking to stay at Winter Park.